Last month when DH accidentally mentioned our infertility in earshot of his Dad, I thought our secret was finally out. Apparently his Dad is so discrete that he didn’t tell anyone, even his own wife. We’re back in the closet. I was talking about Burrito’s colic to my step-MIL — who’d gone through infertility and miscarriages herself. I was not complaining, just describing. My Step-MIL: Imagine what someone who’d gone through years of fertility troubles would feel. She’d appreciate everything about the baby, even the unpleasant things. I know in my heart that I appreciate my babies more than most mothers on this planet. My immense love and appreciation for their presence in my life don’t make it non-distressing for a baby to scream nonstop. For several hours a day. For weeks. You know what a mother who’d gone through years of infertility and losses would feel? She’d want to be able to care for both of her children during those hours instead of giving one more attention than the other. She would still have a hard-wired biological reaction to a screaming baby. She’d love her baby so much that she’d want him not to be miserable for several hours a day. And she’s the good mother-in-law! Burrito and Tamale are 2 1/2 times the size they were at birth, which means they’ve outgrown all of their preemie clothes and almost all of their 0-3 month clothes. I’ve been rotating out the small clothes to make way for the next size. I’ve been putting everything into a box, with the boy and neutral clothes soon headed for my SIL’s upcoming baby, henceforth to be known on the blog as my nephew Murphy. I’ve gotten quite nostalgic about some of the clothes, either due to the tiny size, memories of specific times that the clothes were worn, or the cuteness of the outfits themselves. As I put them into the hand-me-down box, I often have the impulse that I should keep them as mementos instead of passing them along. So far, the only item I’ve actually kept out of the box has been one (but not all) of their NICU hats, which DH describes as “iconic.” I’ve been willing to relinquish potential heirlooms such as booties knitted for the babies by relatives, yet I’m reluctant to part with a store-bought sleeper that just happens to only fit preemies under 7 pounds and just happens to have adorable monkeys. To what end? So that my grandchildren can wear it someday, if G-d forbid they happen to be preemies? So that I can pull it out of the closet as my children get older and bore them with stories of how tiny they were? So that I can selectively idolize the past, ignoring all of the bad emotions that accompanied the good? When I pick up an article of outgrown clothing, kiss it and start crying, DH looks at me like I’ve lost it. Maybe I have. Lest you think my sentimentality began with motherhood, I’ve also kept mementos of the creation process, from IVF pottery to fertility talismans to art purchased to inspire me during treatment cycles. Some of them retain their inherent functional or aesthetic value, but some, like the fertility talismans, probably aren’t serving any purpose just sitting in my jewelry box. Outside of family building, my main mementos tend to be photographs. When I have photos, I don’t need t-shirts or keychains to remind me that I went somewhere or did something. Except for that picture frame I bought on my favorite bridge, which I’m storing in the closet for a few years until I go back there with my children and can put a photo of them on the bridge into the frame. Or those jerseys I bought at foreign sporting events. Or the handmade journal from that tiny shop in Rome. Or that huge box of ticket stubs… You get the idea. It’s a funny balance to try to memorialize the past, look to the future, and mindfully embrace the present. With every hand-me-down that I actually hand down instead of tucking away for posterity, I’m trying to move forward. Even when doing so makes me cry. What do you keep? Why do you keep what you keep? DH’s grandmother’s health isn’t deteriorating as much as we were led to believe. Given her age, she’s doing fantastic. We don’t know what the future will hold, but that’s true for all of us. 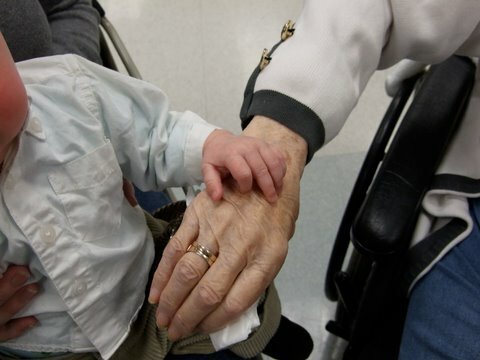 Burrito, age 16 weeks, reaches out to his great-grandmother, age 99 years. Go encounter some other Perfect Moments. DH and I each have one living grandparent. We plan to bring the babies to meet my grandmother in a few months, and they’ll meet his grandmother in a few days. We hadn’t planned to see either of them until the spring when the weather is better, but his grandmother’s health is deteriorating, and we want to be sure that we make the trip before it’s too late. I’m thrilled to be able to introduce her to the babies, despite the circumstances, but it also makes me think of those who never got the chance. In particular, DH’s other grandmother, who died a few years ago and in whose honor Tamale is named. As I described in a post from a year and a half ago, she would have loved these babies so very much, and they would have been so lucky to know her. If she were still alive, she would no longer be able to bake them birthday cakes or knit them sweaters or take them on outings, as she used to do for DH and his siblings. Some things, however, would remain the same. Despite the arthritis and osteoporosis and other diseases of aging, she still would have insisted that Burrito and Tamale eat some fruit when they arrived at her house, and she would have filled their pockets with candy as they left, and in between they would have laughed and smiled and gotten their heads patted and been called a term of endearment in her native language. I started TTC four years before she died, and Burrito and Tamale were born almost four years after that. Of all the negative ways in which infertility has affected my life, preventing my children from meeting this special woman is probably the one that hurts the most. On the bright side, they have two other great-grandmothers, two step-great-grandparents, and all of their grandparents. They have many other people to pat their heads, call them exotic nicknames in Old World accents, and fill their pockets with candy. And, legacies of their late great-grandmother’s love still exist. I have a precious box filled with sweaters she knitted for DH and his siblings when they were young, which Burrito and Tamale will wear throughout early childhood. Tamale will carry their shared name all her life. At least for now, Burrito has her hair color. On special occasions, I will cook some of her recipes for them. I will eventually bring them to her homeland. They can look at photos of her as a child, a young woman, a new grandmother, and an old grandmother. They will hear stories from all of us. Many years from now, I will give Tamale her great-grandmother’s ring. They will hear her philosophy that family is more important than anything. Even though she never met them, they will know that she loved them, very very much. Who did you never get the chance to introduce to your children? Why do you wish they had met? Welcome to the slightly belated Intelligentsia “thing” I’ve been promising. First we’ll celebrate the people who commented on every Thoughtful Thursday post for the month of December, then we’ll do the thing. Wiseguy from Woman Anyone? finishes the year with her perfect record of 12 Intelligentsia appearances, making her the only person to comment on every Thoughtful Thursday for 2009. Hoooooray! Photogrl from Not the Path I Chose thinks 8 is great. Jill from All Aboard the Pity Boat enjoyed lucky #7. Lost In Translation from We Say IVF, They Say FIV completed her sixth Intelligentsia stint. Jules from Just Multiply by 2 came back for the fifth time. Elana from Elana’s Musings and Stacie from Heeeeere Storkey Storkey three-peated. A from Are You Kidding Me? and Lori, a.k.a. Lavender Luz, from Weebles Wobblog returned for #2. To celebrate one year of Thoughtful Thursdays, I’d like to give gifts to the Intelligentsia: fulfilling the hypothetical question of where they’d spend their charity dollars if I handed them the money. Each of the people who responded to last week’s charity TT question directly, who was also a member of the Intelligentsia at any point last year, will be included. A few Intelligentsia members didn’t mention a specific charity, so in their general honor I’ve donated $100 to Partners in Health for Haitian earthquake relief. Cat talked about Heifer International, specifically, a share of a water buffalo because it sounds funny. In addition to the comedy value, a water buffalo also enables a poor farmer to quadruple his rice yield. That water buffalo is on his way, Cat — don’t worry, he’s not coming to your house. Kristin discussed Ronald McDonald House. This charity is newly close to our hearts, since we stayed at the House next to the hospital (over an hour from my home) while Burrito and Tamale were in the NICU. I’ve made a donation to that particular Ronald McDonald house. Elana talked about donating to one of the Jewish schools in her area. In that spirit, I’ve made a donation to a Jewish school in my area. Wiseguy named SOS Children’s Villages. I hadn’t heard of this charity before, but it sounds very worthwhile. They’ll be getting a donation as well. Photogrl passionately described about honoring her mother with a gift to NOCC, the National Ovarian Cancer Coalition. I’ll be making a donation in memory of her mother. Finally, on the topic of disaster relief which kicked the whole discussion off, A talked about the Red Cross. As you wish. By the way, if you donate to the Red Cross or another disaster relief organization, I recommend an unrestricted gift (on the Red Cross website, “where the need is greatest”), which is ultimately far more helpful for organizations than one earmarked for a specific area or situation. Unfortunately, it won’t be long until the next disaster or incident somewhere else in the world. I’m looking forward to another great year of Thoughtfulness! Thanks to everyone who participated in 2009. This week’s earthquake in Haiti, like many natural and man-made disasters in the past, has stirred many people to want to help. In the corner of my TV screen and various webpages are calls to donate money to various relief organizations. Personally, I don’t tend to be reactive with charity. Yes, I was in line with 1000 other people on September 12, 2001 to donate blood, but I was also in line, often the only one, every couple of months for years before that with regular blood donations. I have several regular charities to which I donate money and tend to stick to those, no matter how many calls I get from the Police Action League or depressing commercials I see. I typically donate to several (but not all) of the schools I attended as well as one particular animal rescue organization. Schools’ alumni giving rate is a factor in rankings as well as eligibility for grants; in addition, I feel a genuine connection and loyalty to the schools to which I donate — and not so much to the schools I attended to which I don’t donate. We chose to make the animal rescue organization our primary charity for several reasons. My husband especially is an animal lover like you wouldn’t believe. This particular rescue has policies and practices that we heartily endorse. We’ve been there in person and seen the good work that they do, and we’ve had our faces licked by a few of the residents. I know that most of the money is going to the intended purpose rather than overhead or marketing; it is all too common for charities to spend a large chunk of their donations on getting more donations (hint: if you’re seeing commercials on TV or getting tote bags in the mail, your dollars are not going where you intended). I specifically like animal rescue as a cause because it feels like the money is really going somewhere: it will feed a specific animal for a certain amount of time, or it will spay one particular stray, or it will pay for one particular treatment. I don’t know if we can ever cure cancer or end homelessness, but an end to killing healthy animals due to human irresponsibility is actually an achievable goal in the near future. I also donated money and pottery last year to Share Southern Vermont. First of all, Cara is my bloggy friend, and her passion for the cause is contagious. Second, I know where the money is going. Finally and probably most important, each dollar makes much more of an impact than it would at a huge national or international charity. As with the animal charity, I know that specific families dealing with loss will be helped by my donation. As the Second Wave feminists taught us, the personal is the political. Where do your charity dollars go? Why do you choose the charities that you do? If I handed you $100 to donate, where would you want it to go? 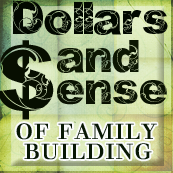 This week’s topic follows last week’s on what kind of person you’re trying to be, as well as a post on another blog. Earlier this week, Carrie from Tubeless in Seattle had a beautiful post about the kind of mother she thought she’d be versus the kind of mother she is. I’ll wait while you read it. Are you a different mother than you’d imagined? Are you still trying to become a parent? What is your ideal role? Do you have peace about your mothering? I am much more willing to share them with others, probably in large part because they are multiples. Ultimately that’s a good thing for all of us. I think if I’d had a singleton I might never let anyone else hold the baby. I am not as doting as I thought I’d be. I just don’t have as much to give as I thought I would. I think that will come with time, and with sleep. Everyone constantly remarks about how laid back we are as parents. I expected that DH and I would be the way we are, but I didn’t realize how non-laid back everyone else is. I know that I am doing a great job of mothering, but peace is not the word I’d use. Can you feel peace with one part of life if you don’t feel it in some others? For Thoughtful Thursday, let’s examine a variation on Carrie’s question. This applies both to those who already have children, as well as those who are working on becoming parents for the first time. As for me, I want to be a mother who loves her children like crazy and expresses that love constantly. I want to show my children the world, literally. We’re already talking about a trip to Europe in the fall, though DH thinks it’s nuts to go when they’re less than a year old and can’t appreciate it. I want to teach them and to help them learn for themselves. I want to ignore the crap that comes with American parenting like consumerism and helicoptering and competitions with other parents. I want to foster their relationships with each other, family, and friends. I want to make the most of every day. I want to think through the decisions I make. I want to enjoy my own non-parenting pursuits like my career and hobbies and, by being away from them sometimes, be a better mother when I’m with them. I want to share this journey with my husband with laughter and sweetness. I want to benefit from the years of infertility by appreciating them for the miracles that they are. Not too tall an order, right?